✴One kind, to which four prefects were usually sent from the body of 26 magistrates who had been elected by the vote of the [Roman] people: [these included] Capua, Cumae, Casilinum, Volturnum, Liternum, Puteoli, Acerrae, Suessula, Atella, Calatia. ✴The other kind, to which those (prefects) went whom the praetor urbanus had sent yearly... ” ( ‘De verborum significationeione’, 262 Lindsay). Thus, we learn that, at least for a time, some towns received four Roman prefects that were selected in the context of the vigintisexvirate (a college of 26 minor magistrates ). Significantly, all Festus’ examples of of this type of prefecture were in Campania. “... while Augustus was still absent from the city [in 13 BC], a decree had been passed that the vigintiviri ... should be appointed from the equites ... [This college of 20 magistrates was] what is left of the vigintisexviri ..., since the two [magistrates of the latter college] who were once entrusted with the roads outside the walls [of Rome] and the four who used to be sent to Campania had been abolished”, (‘History of Rome’, 54: 26: 5-7). Simone Sisani (referenced below, 2010, at p. 176 and note 20) observed that the college of the praefecti Capuam Cumaes was not mentioned in the Lex Acilia Repetundarum of 123 BC, and had therefore perhaps been formed thereafter. However, I wonder whether it was not included because, even by this time, it had no particular legal significance. ✴Capua suffered the confiscation of the ager Falernus in 340 BC and its land was subject to viriatane settlers, for whom the Falerna tribe was established in 318 BC. It is possible that a Roman prefect administered the legal affairs of these settlers, and that he had his seat at Capua. “... [although] some [Romans] thought that a city that was so powerful, near, and unfriendly should be destroyed, [wiser counsel] prevailed: since its territory was well known to be [among the most fertile] in Italy ... , the city was preserved, so that [presumably Roman] farmers of the land might have some abode”, (‘History of Rome’, 26: 16: 7). In other words, the entire territory of Capua, and presumably also that of the other erstwhile rebel centres of Campania, became Roman ager publicus that was available for citizen settlement. It therefore seems to me that the Campanian centres in Festus’ list were probably constituted as prefectures in ca. 211 BC, with three possible exceptions: Volturnum, Liternum and Puteoli might not have been so-constituted until 194 BC, when citizen colonies were founded in each of these locations. I discuss this hypothesis below. “The Latin territory, with the addition of that belonging to Privernum, together with the [ager Falernus] (which had belonged to the Campanian people) as far as the river Volturnus, was parcelled out amongst the Roman plebs. The assignment was: 2 iugera in Latium, [2.75] iugera at Privernum; and 3 iugera [in the ager Falernus]”, (‘History of Rome’, 8: 11: 13-14). “The freedom of the state was granted without the right of suffrage to the Campanians, in compliment to their knights, because they had refused to join in rebellion with the Latins. ... It was determined that the people of Cumae and Suessula should have the same rights and be on the same footing as [those of] Capua”, (‘History of Rome’, 8: 14: 11-2). “The Acerrans were enrolled as Romans, in conformity with a law introduce by the praetor, Lucius Papirius, by which the right of citizenship with the privilege of suffrage was conferred”, (‘History of Rome’, 8: 17: 12). Thus, the fertile ager Falernus, which had probably belonged to Capua, was confiscated and Capua itself, together with the Campanian centres of Suessula, Cumae and Acerra were formally incorporated into the Roman state as civitates sine suffragio (without voting rights). “... prefects began to be elected and sent out to Capua, after Lucius Furius, the praetor, had given [the Capuans] laws —both steps being taken at the instance of the Capuans themselves, as a remedy for the distress occasioned by internal discord.” (‘History of Rome’, 9: 20: 5-6). ✴they began to receive prefects who were elected in (and presumably sent from) Rome. “At Rome two tribes were added, the Oufentina and the Falerna” (‘History of Rome’, 9: 20: 6). ✴the Falerna was named for the ager Falernus in Campania. We might reasonably assume therefore that the level of citizen settlement in the ager Falernus was significant. There is nothing in the surviving sources to indicate that the prefects mentioned by Livy, who were sent to Capua from 318 BC, had any jurisdiction in this territory. Nevertheless,as noted above, it is possible that the legal affairs of the settlers in the ager Falernus were administered by a Roman prefect who had his seat at Capua. If so, then this arrangement presumably ended with the revolt of 216 BC. “... the loyalty of [their] allies, who had held firm until [that point], now began to waver: ... these are the peoples that revolted [included]: the Campanians [by which, he means the Capuans], the Atellani, [and] the Calatini ...”, (‘Roman History’, 22: 61: 10-11). “... was given back to the Campanians, and a garrison of 700 men from Hannibal's army was placed in it in case the Romans should attack it after Hannibal's departure”, (‘Roman History’, 23: 20: 1). 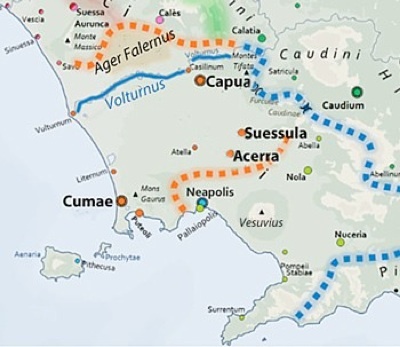 “Quintus Fabius, the consul, was encamped before Casilinum, which was occupied by a garrison of 2,000 Campanians and 700 of the soldiers of Hannibal. The commander [of the rebel army] was Statius Metius, who was sent there by Cnaius Magius Atellanus, who was that year meddix tuticus ... [Casilinum] was captured on an accidental opportunity ... the prisoners, both those who were Campanians and those who were Hannibal's soldiers, were sent to Rome, where they were shut up in a prison. The crowd of townsmen was distributed among the neighbouring people to be kept in custody” (‘History of Rome’, 24: 19: 1-11). “... the majority of the senate of Capua, not doubting that the clemency of the Roman people, ... voted and sent legates to surrender Capua to the Romans”, (‘Roman History’, 26: 14: 2). “Atella and Calatia surrendered themselves, and were received. Here also the principal promoters of the revolt were punished. Thus 80 principal members of the senate were put to death, and about 300 of the Campanian nobles thrown into prison. The rest were distributed through the several cities of the Latin confederacy, to be kept in custody, where they perished in various ways. The rest of the Campanian citizens were sold [into slavery]”, (‘History of Rome’, 26: 16: 4). “Some [Roman senators] were of opinion that a city] so eminently powerful, so near and so hostile [to Rome as Capua] ought to be demolished. However, i wiser counsel] prevailed: since its territory was well known to be [among the most fertile] in Italy ... , the city was preserved, so that [presumably Roman] farmers of the land might have some abode. ... The multitude of resident aliens and freedmen and petty tradesmen and artisans was [allowed to remain in the city. Its] entire territory and the buildings became public property of the Roman people. ... the mass of citizens were scattered with no hope of a return”, (‘History of Rome’, 26: 16: 7-11). “It was decided that Capua, as a nominal city, should merely be a ... centre of population, and that it should have no political body nor senate nor council of the plebs nor magistrates. ... the Romans would send out every year a prefect to administer justice. ; no rage was vented upon innocent buildings and city —walls by burning and  demolition. and [p. 65]along with profit they sought a reputation among7 the allies as well for clemency, by saving a very important and very rich city, over whose ruins all Campania, all the neighbouring peoples on every side of Campania, would have  mourned. the enemy were forced to acknowledge what power the Romans possessed to exact punishment from faithless allies, and how helpless Hannibal was to defend those whom he had taken under his protection”, (‘History of Rome’, 26: 16: 9-11). “In this consulship, Caesar, with Pompey's backing, passed a law authorising a distribution to the plebs of the public domain in Campania. And so about 20,000 citizens were established there, and its rights as a city were restored to Capua 152 years after she had been reduced to a prefecture in the Second Punic Wa” (‘History of Rome’, 2:44:4). ✴Cumae and Acerrae remained loyal to Rome throughout the Second Punic War, and it is hard to see why they would have been condemned to an administrative vacuum thereafter. Cumae was still an Oscan-speaking community in 180 BC when, according to Livy (40: 42: 13), its people asked the Senate in Rome for permission to use Latin in certain public affairs, which suggests that they still retained the Oscan magistracy that Capua had lost in 211 BC. “... the sands and hideous swamps of Liternum”, (‘History of Rome’, 22: 16: 4). “Meanwhile Tiberius Sempronius, the Roman consul, having purified his army at Sinuessa,... crossed the Vulturnus and pitched his camp in the neighbourhood of Liternum”, (‘History of Rome’, 23: 35: 5). -a garrison was stationed in Puteoli, which Fabius had formerly fortified, in order to have the command of the neighbouring sea and the river. Into these two maritime forts, the corn recently sent from Sicily ... was conveyed from Ostia, to supply the army during the winter”, (‘History of Rome’, 25: 20: 1-3). Simone Sisani (referenced below, 2010, at p. 176 and note 20) suggested that this college of the praefecti Capuam Cumaes was probably created after 123 BC (since it was not mentioned in the Lex Acilia Repetundarum of that year). From that point, these prefects presumably exercised jurisdiction over the ager Campanus from Capua and Cumae. ✴It seems to me that Cumae and Acerrae were probably unaffected by the retribution of 211 BC and retained their traditional magistracies throughout the 2nd century BC. ✴As noted above, Volturnum, Liternum and Puteoli were probably administered by duoviri from their foundation of colonies in 194 BC. However, given their small size (perhaps 300 citizen families were settled at each of them), they might also have received (perhaps shared) a prefect who was sent from Rome to administer justice. We might reasonably assume that the subsequent establishment college of the praefecti Capuam Cumaes was related to a marked increase in the number of Roman citizens in the region. ✴Saskia Roselaar (referenced below, 2008b, at p. 579, p. 582 and note 17) described the process of selling or leasing land in the ager Campanus, that had been confiscatedin 209 BC: in short, it proceeded in fits and starts until its completion in 165 BC. 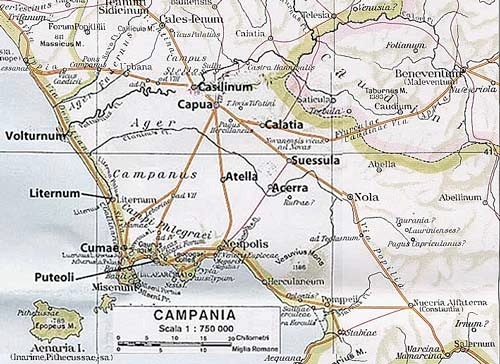 ✴However, Saskia Roselaar (referenced below, 2008a, at p. 47) pointed out that further land distribution took place in Campania (albeit outside the ager Campanus) under the auspices of the Gracchi in the late 2nd century BC. I wonder whether Cumae, for example, catered for the legal needs of its own residents, albeit that it also acted as the seat of the prefects who met the needs of Roman citizens in the settled nearby. ✴that children born before this day should be legitimate and capable of inheriting from their fathers. Both requests were granted”, (‘History of Rome’, 38: 36; 5-6). We know from later records that Capua and Cumae nevertheless retained their Oscan magistracies for decades: until 211 BC for Capua; and until at least 180 BC for Cumae.